Wild Thang commit to continue to support the Mayoral 100 Club in 2019 Merchandise in action Red Devils too hot for London! We hope that romance is not dead & given that it’s very close to Valentine’s Day we reckon this little box of chocolates would keep you in the good books for more than a little while. Thornton’s broke the World Record for the world’s largest box of chocolates which was unveiled to the public in London’s Leicester Square in April 2010. 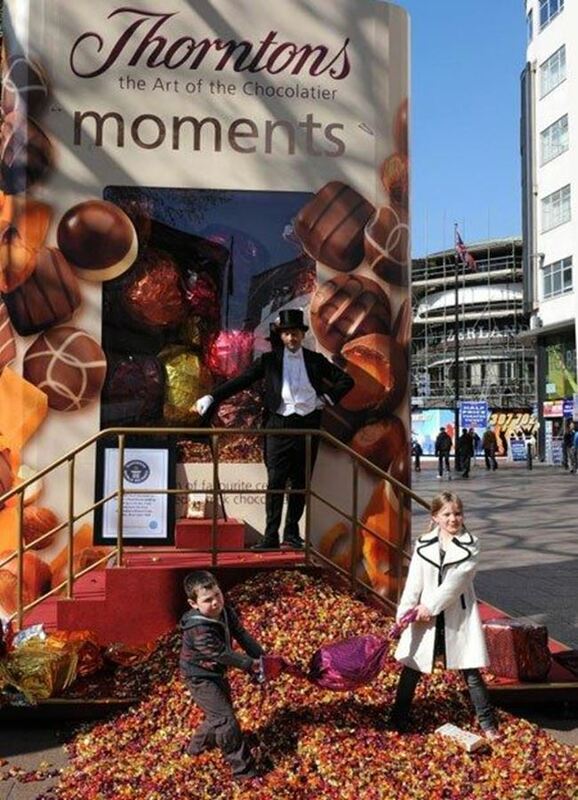 The giant box was created to celebrate the launch of Thorntons ‘Moments’, the Chocolatier’s new twist-wrapped chocolates, measuring 5.04 metres (16.5 feet) tall and 3.5 metres (11.5 feet) wide, total box weight was 4,805lbs - that's over 2 tonnes! Containing a total of 220,052 individually wrapped Thorntons Moments, research shows that branded confectionary products are one of the most popular ways to promote your brand and create that feel good factor. Please remember we are here to help with expert branded clothing, merchandise & print advice. At Wild Thang we have a great range of confectionary from personalised boxes of chocolates to branded jelly beans so why not take a look at the extensive range.